Semi-finished paste product used to prepare cold and warm base mixes for homemade VANILLA- flavoured ice creams and cold desserts. 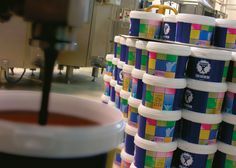 Semi-finished paste product used to prepare cold and warm base mixes for homemade NOUGAT-flavoured ice creams and cold desserts. Semi-finished paste product used to prepare cold base mixes for homemade STRAWBERRY-flavoured ice-creams and cold desserts. Semi-finished paste product used to prepare cold and warm base mixes for homemade PISTACHIO-flavoured ice creams and cold desserts. Semi-finished paste product used to prepare cold and warm base mixes for homemade HAZELNUT-flavoured ice creams and cold desserts. Semi-finished paste product used to prepare cold and warm base mixes for homemade CHESTNUTS-flavoured ice-creams and cold desserts.